1989. Prominent hillside near Port Townsend, WA. Trenched design filled with discarded oyster shell to one-foot depth. Discarded oyster shell, hillside, hand and machine trenching. Proposed 500' long. Proposed 500 foot image on a very visible hillside near Port Townsend, WA. Trenched recycled oyster shell. 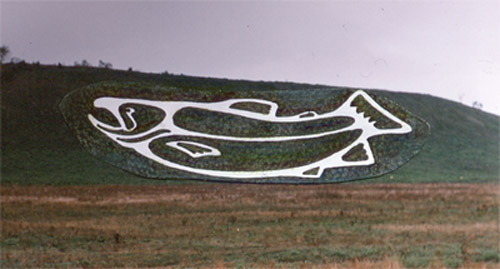 The salmon image would be situated near and above a decades long intensive salmon restoration stream. It is meant to attract attention to the local importance of salmon, especially to newcomers.